The liver weighs three pounds and is the largest solid organ in the body, which performs many critical functions. The Liver is responsible for blood proteins that aid in clotting, immune system function, and oxygen transport. Storing surplus nutrients and replacing some of the nutrients to the bloodstream. Developing bile which is a substance that is used to help digest food. Cirrhosis is a progressive disease that slowly changes health liver tissues into scar tissue, which eventually prevents the liver form functioning properly. The scar tissue blocks the flow of the nutrients, hormones; nutrients produced toxins and drugs. It slows down the production of proteins and other substances created by the liver. According to the National Institute of Health, Cirrhosis is the 12th principal cause of death by disease. What Causes the Cirrhosis of the Liver? Repeated Challenges of heart failures with fluid backing up into the liver. Blockages to the bile duct, which can carry bile produced in the liver to the intestines, where it supports in the digestion of fats; in infants, this can be triggered by biliary atresia in while bile ducts are damaged or absent. Thiscauses bile to back up in the liver. In adults when bile ducts are damaged, inflamed, scarred, blocked due to another liver disease, which is referred to as primary biliary cholangitis. Glycogen storehouse diseases, in which the body is not able to process glycogen, a form of sugar that is transformed to glucose and serves as a source of energy for the body. Diseases caused by abnormal liver function, such as hemochromatosis, a condition in which excessive iron is absorbed and deposited into the liver and additional organs and Wilison’s disease, triggered by the abnormal storage of copper in the liver. However less likely, other causes of cirrhosis which include reactions to prescription medications, parasitic infections or extended exposure to environmental toxins. Do Individuals who Drink a Significant amount of Alcohol Always Get Cirrhosis of the Liver? Most people who drink large amounts of alcohol harm their Always get Cirrhosis of the Liver. Most people who drink large quantities of alcohol harm their lives in some way; however, not all of these people endure cirrhosis of the liver. Women who are heavy drinkers tends to be higher risk than men. People who suffer from hepatitis B or C are more likely to experience damage from alcohol. What are the Symptoms of CIrrhois of the Liver? Confusion, personality changes or disorientation. Jaundice, Yellowing of the white of the eye and the skin will become yellow. Fluid retention, swelling in the abdomen, legs, and ankles. Several techniques determine cirrhosis of the liver. Blood test. If your doctor suspects cirrhosis, you will gene blood test to find out if liver disease is resistance. Biopsy – Your doctor may take a sample portion of tissue (biopsy) from the liver to confirm the diagnosis. Surgery- In some cases, cirrhosis is diagnosed during surgery when the doctor can see the entire liver. The liver also cans are inspected through a laparoscope, a viewing device that is inserted through a tiny incision in the abdomen. 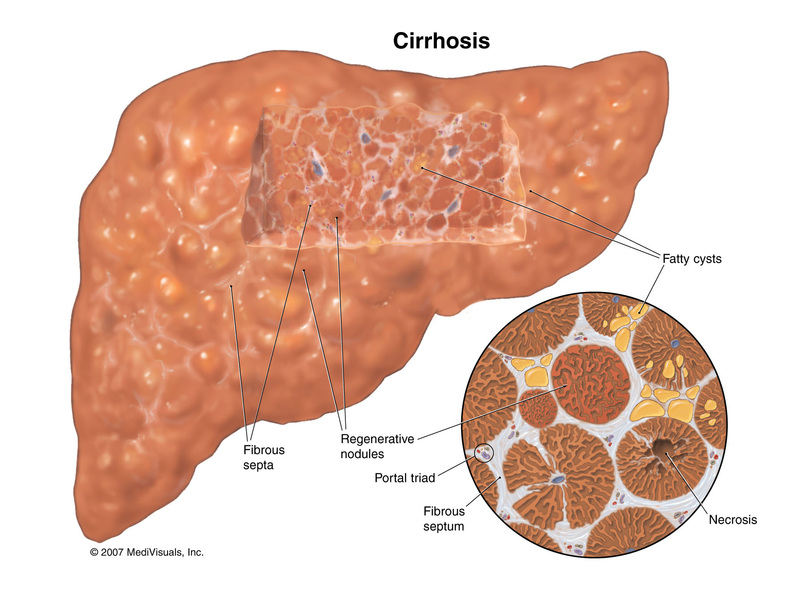 What are the Complications that are caused by Cirrhosis of the liver? Variceal bleeding – Variceal bleeding is caused by portal hypertension, which is an increased in the press within the portal vein ( the large vessel that transports blood from the digestive organs to the liver) This increase in pressure is produced by obstructions of blood flow through the liver as a result of cirrhosis. The increased pressure in the portal vein induces other veins in the body to enlarge (varies), such as these in the esophagus and stomach, to bypass the blockage. These variances become fragile and can bleed easily, causing severe homorganic and fluid in the abdomen. Hepatic encephalopathy most frequently occurs when cirrhosis has been present for an extended period. Toxin created in our intestines are normally detoxified by the liver, by once cirrhosis occurs, the liver can not detoxify as well. Toxins go into the bloodstream and may cause confusion and shifts in behavior and even coma. Additional serious complications of liver cirrhosis. Many of these complications can initially be treated with drugs or dietary changes. Once treatment for these complications grows ineffective, a liver transplant is considered as an option. Almost all of the complications can be remedied by liver transplantation, however in many circumstances; careful management can decrease the harmful effects of cirrhosis and delay or even prevent the need for a liver transplant. While there is not a cure for cirrhosis of the liver, there are procedures available that can stop or delay its development, minimize the damage to liver cells and reduced complications. The treated used depends on the cause of cirrhosis of the liver. For cirrhosis prompted by alcohol abuse, the person has to stop drinking to stop the progression of cirrhosis. If someone has hepatitis, the physician may prescribe steroids or antiviral drugs to reduce liver cell injury. For people with cirrhosis generated by autoimmune diseases, WIlson’s disease, or hemochromatosis, and treatment varieties. Medications may be given to control the symptoms of cirrhosis, such s ascites, fluid in the abdomen, and Edema, fluid retention are treated, partly, be decreasing salt in your diet. Drugs referred to diuretics are used to remove excess fluid and prevent edema from occurring again. Diet and medication therapies can help improve the altered mental state that cirrhosis can cause. Laxatives such as Lactulose may be given to help abuse toxins and speed their removal from the intestines. Liver Tran late nation may be needed for some people with severe cirrhosis. Do not abuse alcohol. IF you drink alcohol, you should limit how much and how often you drink alcohol. Remember it is no only heavy drinkers that get cirrhosis. If you drink more than two drinks a day, you are at an increased risk. A drink is a 5 oz glass of wine, or a 12-oz can of beer, or 1 ½ -oz portion of hard liquor. Bypass high-risk sexual behavior such as unprotected sexual contact with multiple partners. Be cautious around synthetic chemicals such as cleaning product and pesticides if you come into contract with chemicals often, wear protective clothing a facemask. Eat a well-balanced, low-fat diet high in fruit and vegetables and take vitamins. Keep a healthy weight, because excess body fat can cause fatty liver which can lead to liver disease.